The buzz around the latest kid on the block does not seem to stop. In a latest development, the US Website for the 2011 Honda CBR 250R has been updated with the ex-showroom prices of the bike in US. 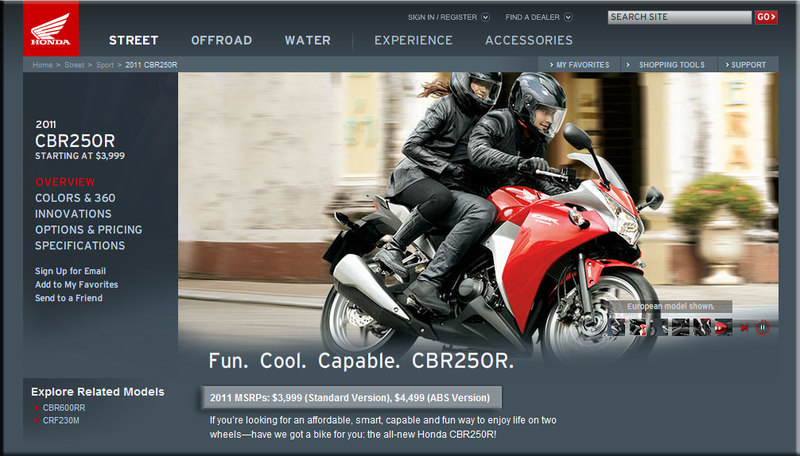 As per the website, the Standard version would cost $3,999 (which is exactly at the same US price as the Kawasaki Ninja 250R) and the C-ABS version would cost $4,499. As per the current exchange rate, the Standard version comes to ₹1,80,174.94 and the C-ABS version comes to ₹2,02,702.44 in Indian currency. But a factor that needs to be considered here is that, the 2011 Honda CBR 250R would be manufactured in India and it has been already said that there would be a lot of localization of parts that would be done for the bikes that would be sold in India. Therefore we should be in for a delight of the price tag being on a bit towards the lower side that the above figures. But easier said than done, nothing can be speculated about the Indian price of the final product unless it's launched officially in India around April, 2011.
:) I won't call it the best, even though I own a Bajaj Pulsar 200 and I totally love it. Specially it's high CG, suspension and weight does bog it down. Am happy that Honda is taking the Indian market seriously and setting up India as an export base. Bikes like the Yamaha R15 and the Honda CBR250R will only make the competition intense and improve the breed of bikes that we ride. I'm really getting interested now to see how the other Japs react to Honda's strategy of manufacturing CBR 250R in India.